You can use any type of rubber stamp with your scrapbook pages. Use your favorite stamps to stamp designs onto your scrapbook pages. Many scrapbookers find clear acrylic 'rubber' stamps best for scrapbooking because they can see where they are placing the stamped image. While traditional rubber stamps with wooden handles are more difficult to see where you are placing the image, with transparent stamps which are temporarily mounted onto a clear stamping block, it is very easy to precisely place your stamped image. It's possible to purchase placement tools for helping you to accurately place your images, however, if you are starting out clear stamps may be the best to start with. Of course, if you are simply stamping a design over the scrapbooking paper to create an all-over pattern, traditional wooden handled stamps will be fine because precise placement isn't important. Alphabet stamps - alphabet stamps are versatile and allow you to stamp words such as names, dates, sentiments, and greetings. You will find alphabet stamps in a range of styles from whimsical to bold block letters. One or two sets of alphabet stamps are perfect to get started with. Check that your stamp set comes with numbers or whether you have to purchase the numbers separately. You can find a wide range of alphabet stamps to buy online. Corner stamps - corner stamps are stamps which you can use to decorate the corners of your scrapbook page or to decorate around the edge of a photo. These are often ornate stamps and can also be used to add decoration elsewhere on the page. If you want to try something different, try stamping a series of corner stamps to create a pattern. Corner stamps often have a Victoriana feel and are lovely for vintage themed projects. Check out some examples of the different types of corner stamps available online. Another type of stamp to look out for is frame stamps. These are stamps which form frames and are ideal for stamping around a photo or a sentiment. Outline stamps - the two types of stamps we mentioned above are typically solid image stamps and don't need coloring. Outline image stamps are, as the name suggests, outlines of designs for you to color. These can be a great way to add your own color to your scrapbook page and are a way to make your scrapbook page truly different. Many people enjoy the meditative effect of coloring and find this a relaxing addition to the scrapbooking project. Outline stamps can be colored in a whole variety of ways. You can use marker pens, pencils, decorating chalks (or pastels) or even watercolor paint. The type of coloring method you use will determine the finished effect of your scrapbook page. Solid design stamps - these are stamps with designs which you can simply ink and stamp and not worry about having to add color later. These will add bold dashes of color to your scrapbook page and are perfect for adding decorative embellishments to your page. Journaling stamps - journalling stamps are stamps which have been designed specifically for journaling and these are ideal for use in scrapbooking projects. Journaling stamps will often have lines for text and perhaps keywords to use as labels. Journalling rubber stamps are useful if you worry about wobbly writing and don't want to draw lines on your page. You'd think that stamping an image was simple - just ink the stamp and press it on the page! And in reality, that's all there is to it. However, if you want to achieve good crisp results it gets a little more complicated. When you are stamping onto a scrapbook page, you are often stamping onto good quality scrapbook paper, and as such you don't want to make a costly mistake. Therefore putting a little extra effort into your stamping to create great looking results is worthwhile. Many people find they get better results if they stand up when they stamp so they can be sure that they are pressing down equally with their stamp. This is typically the case when using large stamps. When you sit down you may not press equally on your stamp because you cannot gauge so easily how much pressure to give. This results in one side of the image looking different to the other. As well as stamping directly onto the page, you could consider stamping onto scraps of paper and adding this to your scrapbook page as embellishments. This is a good way to make sure that wobbly images don't spoil the finished effect of your project as well as a great opportunity for using scraps of paper. This also means that you don't need to worry about the correct placement of your stamped image. 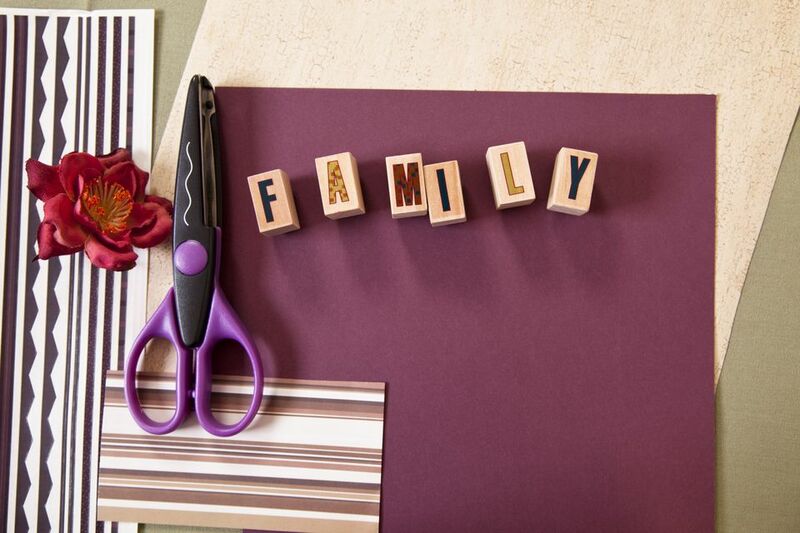 If you add a piece of paper as an embellishment to your scrapbook page, try cutting the edges with patterned edge scissors to create an attractive finish. You can also run your ink pad around the edge of the paper to create a more 'finished' look. If you want to add some color, you could run the side of a marker pen around the edge of the paper. This stops the paper embellishment looking as though it has been stuck on as an afterthought. An alternative to cutting paper to make embellishments is tearing. Paper tearing gives a lovely feather edge and you can enhance this more with ink or even chalks to highlight the textured effect of the torn edge. If you are creating an heirloom scrapbook which is going to mark a significant family occasion or a scrapbook you want to last a long time without deteriorating, it's important to use supplies which are of archival quality. Have you ever left a piece of printed paper in daylight? After a while, the paper may yellow and the printer ink may fade or change color slightly. The same can happen in your scrapbook album if you don't use the correct supplies. You will need to look for acid-free supplies and also ensure you use archival quality rubber stamping inks. If in doubt, ask at your local craft store for ink pads which they recommend. It is worth investing in the best quality ink for your scrapbooking project because while hand stamped gift wrap, for example, is nice, it is not intended to last so it doesn't matter if the ink fades. On the other hand, your precious scrapbook pages are a different matter and you want these to last, so invest in the best to start! Another feature that rubber stamping and scrapbooking have in common is that they both have digital alternatives. Digital scrapbooks are very popular and you can use digital stamps with your digital scrapbooking supplies! This is a convenient way to produce scrapbook pages and is great if you want to share your scrapbook page online. Hopefully, this has inspired you to try using your rubber stamps to decorate scrapbook pages whether it's for yourself or to give as a gift. Rubber stamping and scrapbooking are such great crafts, it's fun to use them together.